I have a confession to make: I thought that Nathan Myhrvold had been wasting his time for the last few years. Here was a guy capable of decoding secrets of the cosmos and instead he was spending months perfecting his recipes for Osso Buco and Oeuf en Meurette? I love good food as much as anyone and I have enjoyed many a meal with Nathan , often cooked by him, but I could not imagine that any cookbook could be worth the years of effort that he put into this project. As soon as I started reading Modernist Cuisine, I realized that I was wrong. Nathan and his team have created a lasting contribution human culture. This is not just a cookbook; it is the culinary Principia. Nathan uses food as a window into science just as Newton used the motions of the planets. In truth, it serves as a better window, because who among us cannot relate to mysteries of a lumpy white sauce or a fallen soufflé? Nathan takes his readers on a tour of chemistry, microbiology, optics and thermodynamics, all entered through the kitchen. Secrets are exposed, mysteries unveiled, and familiar principles re-explained in a new light. I do not intend this as book review, but as an introduction to Nathan. Nothing could better serve to illustrate his brilliant and eclectic mind. The multi-disciplinary science, the stunning photography, the lucid prose, the generous credit he gives to his co-authors and the sheer fun-loving insanity of a 2438-page cookbook, all illustrate essential aspects of Nathan's unique personality. Enjoy the feast. NATHAN MYHRVOLD is CEO and a founder of Intellectual Ventures, a firm dedicated to creating and investing in inventions. Myhrvold is himself an active inventor, with nearly 250 patents issued or pending — including several related to food technology. Before founding his invention company, Myhrvold was the first chief technology offi­cer at Microsoft. He established Microsoft Research, and during his tenure he over­saw many advanced technology projects. He left Microsoft in 1999 to pursue several interests, including a life­long interest in cooking and food science.He is the coauthor (with Bill Gates) of The Road Ahead and the five-volume Modernist Cuisine. W. DANIEL ("DANNY") HILLIS is Chairman and Chief Technology Officer of Applied Minds, a research and development company creating a range of new products and services in software, entertainment, electronics, biotechnology and mechanical design. An inventor, scientist, engineer, author, and visionary, Hillis pioneered the concept of parallel computers that is now the basis for most supercomputers. He is the author of The Pattern on the Stone. [NATHAN MYHRVOLD:] Science is how we understand how the world works. It is the process by which we discover the fundamental laws of nature, and of course, those fundamental laws of nature are behind everything. Engineers, for example, use that knowledge to design buildings, airplanes, cars, chips, software and so forth. People almost irresistibly want to know how things work. In the case where science doesn't have a good idea as to how cooking works, or perhaps instead, when science has an idea but chefs don't, chefs make up stories. We're a story-telling species. There were lots of stories like, "oh, you sear a piece of meat to seal in the juices." It turns out exactly the opposite happens. If you sear a piece of meat, more juices come out than if you don't. But there is a certain conceptual satisfaction in thinking, "ah, I'm searing it because I'm sealing in the juices." For this book, we set out to describe the science of cooking — and do so in a very visual way. Other people like Harold McGee, in 1984, wrote a book called On Food and Cooking, which is a seminal work that started a whole trend of people explaining the science of cooking to both average people and chefs. Therefore we were not the first, but we decided that we would have a more visual description. We would first explain how traditional cooking actually works and then use that as a springboard to talk about more modern cooking techniques and how you can use them. Not only have we written a book, but we have written a paper-based book — we don't have an electronic edition. There are a couple of reasons for that. The first is that every task should have the best appropriate technology deployed behind it. If you want to deploy large, beautiful, high-resolution pictures to people in the world of cooking, there is no better platform in 2011 than a paper book. I love Blackberrys and iPhones and iPads, but these new technologies and even laptops, aren't as good for this task. The resolution is limited and the ability to do interactivity is not important enough yet. Everyone says, why don't you have an iPad version? Well, the iPad actually came out years after we had already decided to do a book. The iPad is only so big. I could go on and on — there are lots of limitations. It's wonderful in many ways, but it's not as wonderful as having a large book that you can spread out on the counter. A book: it's bigger, it's higher resolution, it's more permanent, it's better for taking into the kitchen. For the set of people that I want to reach — the people who are passionate about food and people who are professionally into food- they don't all have iPads yet. One reason people suggest an electronic edition is because they want it be cheap. My response is, well, actually I think a good interactive version would be a lot more expensive than the paper edition. Once you make it interactive, you want to have video and video is way more expensive to produce than still photos. Then, you would like to have it be interactive so you can manipulate recipes and you can scale them. That means you've got to hire a bunch of programmers. I hope to have an interactive version at some point in time, but for right now in 2011, a book is the best thing to do. The other thing I really find interesting is that there has never been a better time to make a paper-based book, which sounds crazy because isn't this the age of digital? But in fact all of those digital tools make it easier to make the paper thing. We're working with a fabulous printer in China called Artron. We exchange digital files with them, they have very state-of-the-art equipment, everything gets totally calibrated, and they Fed Ex back and forth the various galleys to us. We work with a whole collection of editors that contributed to the book. The indexers are people in Maryland who I have never met and yet they are creating the index and working with us as if they were part of the team, even though the rest of us are in Seattle. We probably had a dozen contributors to the book like that. Without the Internet we never could have done that. Without digital photography, we couldn't have done the sets of photos that we did. Even though we think of this as the age of digital, digital tools have enabled paper-based books to be better, higher quality, and faster than at any point in previous history. I'm not sure actually who is going to buy and read the book. We've created this without focus groups. There are two fundamental approaches you can take to designing a book or any product for that matter. You can run all kinds of focus groups and do market research and ask yourself, "what do people want?" There are a lot of very successful products that are made that way. Or you can say, "I'm going to follow my own curiosity and vision and make the book that I would love to have and hope someone agrees." That is the algorithm that we took for this book. I'm hoping that the people who buy it, use it, and love it are people who love food, regardless of whether they are amateurs at home or professional chefs. If you really love food, you'll be curious as to how cooking works. You'll want to see the beautiful photos of food because we have put a huge effort into making the book very visual. We also have a lot of complicated technical information explaining how heat transfer works inside food, for example, explaining microbiology and how microbiology actually can impact cooking. But we try to make that very accessible. So I would hope that this is bought by people who feel that they can dip into it and take what they need, which might mean treating it like a coffee-table book and looking at the pictures. Or it might mean studying it as a textbook in a culinary school, or anything in between. I've learned both about the publishing business and lack thereof, and I've also learned a lot of things about the science of cooking, as we got into explaining it. One of the justifications for having professors do both research and teaching is that teaching stimulates questions and research. The other justification is that students make cheap labor for experiments, and they're both true. It turns out that the the notion of having to explain something focuses you on the right questions, and that has been very important for us. There were lots of new topics we came across when figuring out how to explain something else. Or we realized the world does know how something works, but we were prompted really to dive into it and find the folks that know. So I have learned a tremendous amount about cooking and about food science while trying to explain it to other people. I know probably twice as much as I did when I started writing the book. This is a field where nobody knows everything and there are a lot of things that I still don't understand. Science is an iterative process. Lord Kelvin knew everything about physics in his day, and Einstein did later in his day. And yet today, we know vastly more than either one of them did. One of the things that was interesting on a project like this is that it was a team effort. A lot of books — and one of the wonderful things about books whether they are fiction or non-fiction — is that they can be a single person's vision. But in this case, I chose a vision and a mission that was way more than a single person could do. And so I had to run this like I would run a software project or a research group. At peak we had 36 people full time working on the book. We had about 18 for a period of 3.5 years overall. Now, that is wonderful and it has some issues. The wonderful part is that you benefit from everybody's knowledge and you get pushed in ways that you wouldn't have gotten pushed otherwise. There are lot of things where I would have said, "oh, forget it, we don't need to do that," but somebody else got excited about it and by the time I realized it, we had already done it. The bad part is you have to negotiate things. You have to make decisions as a team. Somebody has to be Solomon and cut the baby sometimes and say, yes, that is enough. You may think that we didn't have very many "No" decisions given that we have 2,400 pages. But in fact there was a ton of stuff we left out because I didn't want to have 24,000 pages. Running a book project as a team is unusual and of course, it's unheard of for novels. It's common for textbooks but most textbooks as a result lose a personal focus. They were created by a committee and they read like they were created by a committee. We are hoping that in this book we struck the right balance, which is what a research team, say, in computer science has to do. It is about finding the right balance between pushing the envelope in some ways, but being pragmatic enough and focused enough to get the task done. We have a six-volume book and there is a whole lot we cut or left out, or didn't finish, which we could easily make into volume seven or part of a revised edition one day. Also, we did nothing or very little in the book on dessert, baking, or pastry. In the cooking world there is savory cuisine and there is dessert, baking and pastry, and they are two really separate worlds. We drew the line there. So an obvious thing to do next would be dessert, baking and pastry. But we just finished 2,400 pages, which means we just finished proofreading 2,400 pages endlessly. My next book, at least for the next year, is no book at all. We've got to take a little bit of a breather. Cooking, particularly as it's practiced by either professional chefs or amateurs, is full of lore and legend that has no basis in any scientific reality. There are lots of myths. There are lots of bits of disinformation. Or where there is some valid basis, the valid idea is wrapped in several others around it that are quite different. Another interesting thing is that cooking as it's typically taught and practiced is very backward looking. Most cook books are limited to ideas that are 40 or 50 years old. That sounds kind of crazy but it is really true. The most recent set of innovations that have really gotten mainstream acceptance in cooking are the ideas of nouvelle cuisine or new American cuisine. These ideas started in the 1960s, blossomed in the '70s and into the '80s, and were largely set by 1985. There are a set of cooking techniques which chefs have pioneered from the mid-1980s onward. You can find them in a few books, for example, by Ferran Adrià, the chef at the restaurant El Bulli in Spain, or Heston Blumenthal, chef at the Fat Duck, or Grant Achatz of Alinea in Chicago. But those are very much in the minority. Those books, as wonderful as they are, are a single chef talking about their vision. In terms of broad books that say, "here is a step-by-step technique, here is how you cook with liquid nitrogen, here is how you cook suvee, here is how you cook with hydrocolloid gels," those topics are just not treated at all, or treated with great mysticism or superstition or misinformation.Another area that is full of bad facts is food safety. Most of what the majority of chefs have been taught about food safety is completely wrong, or at best very incomplete. In looking at food safety we found lots of bad information, lots of areas where the actual official government FDA specs contradict what most people actually do. We found other cases where the government FDA specifications or regulations are just wrong. They made mistakes. I met with the FDA in Washington, D.C. about this. They generally don't have people coming and telling them that they made mistakes. The process isn't oriented around that. So the whole food safety sector is one where we challenge lots of conventional wisdom. The world of publishing is simultaneously both wonderful and screwed up. It is wonderful because the written word, or the communication of the written word, is one of the great cultural institutions on Earth. It's how most of us learned most of our knowledge. So I love books. I always say "I don't know this with 100 percent accuracy". I'm the leading customer at Amazon.com. I buy a lot of books — many thousands of dollars worth in books each week. I used to buy all physical books. Now I buy both physical books and Kindle books. I love books but the way that the publishing industry is oriented has not really caught up to either digital technology, or the way you can market things on the Internet, or frankly almost anything. The book world seems to be optimized for a very small niche, which is books that you can sell in mall bookstores. If you have something that really appeals to every man and you want it in every mall bookstore, the system works reasonably well and is sort of optimized for it. If you wanted to have a book that takes chances, that is not what this industry is about. Fortunately there are enough publishing executives who will take some chances around the edge and it's relatively inexpensive for most books to get created. But if I had to rely on a publishing company to finance this book that I created, they never would have done it in 100 years. Maybe in 100 years they would do it but they would wait until it was very, very proven. The wonderful part about human creativity is when you take risks. Yet this publishing world isn't much about taking risks. It is not much about marketing the book either, frankly. It is hoping that the book will get out there and market itself. But in the current world of the Internet, we put our book website live, within 72 hours we had hits from 91 countries. Now, this is for a book that is on a pretty obscure topic — a very specific look at modern cuisine and the science of cooking. We did not do some giant PR event. 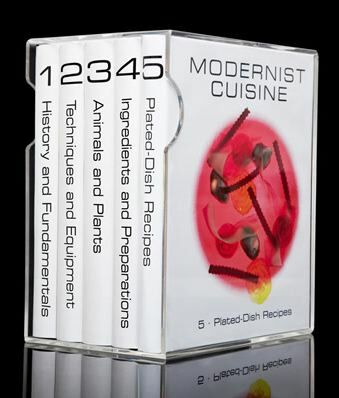 I sent emails to a couple of websites and lists, like the molecular gastronomy list. I posted some things on Egullet and I sent emails to a bunch of my friends. Within 72 hours we had people in Azerbaijan logging on to look at the website. How? I don't know but there is some chain of events where there are people all over the place that could tap in. That's one example of how marketing the book is totally different with the Internet. Producing the book is different. The world of publishing has been so oriented around inexpensive books, which is wonderful in many ways. It's great that the world is focused on cheap things that you can sell to lots of people. But image a world of restaurants where the only restaurants were chain restaurants that were in malls, where Ruth's Chris was the most high-end restaurant in the country? Not that Ruth's Chris is bad. I go there and it's a great thing. But Ruth's Chris and PF Chang's are not the sum total of the restaurant world. But publishing executives want their books to be at best Ruth's Chris. In fact, they would really prefer the Cheesecake Factory. So cookbooks are all made to be the Cheesecake Factory of restaurants. The Cheesecake Factory is great, I am not denigrating it. But it is wonderful that there is an El Bulli, that there is a Per Se, there is a Le Bernardin, a Daniel, that there's a Momofuku, that there's a variety of restaurants that in their own way, some very high end, some not particular expensive or high end, but it's that cultural richness that makes the world of food fantastic. Yet that richness doesn't exist in cookbooks because of the restless focus on high-volume cheap books you sell in mall bookstores. It forces the cookbooks to be all alike. We wanted to make a book that was more high-end, that was a quality product in and of it self, that had really nice paper, and nice printing. There is no way we could have done that in the world of publishing. So the principle that we have here is that this book will stand out. It will be unique enough and special enough that through the Internet and through word of mouth, enough of the people who would be delighted to own it will find it and be able to buy it that it'll be worth our while. For the same reason that you can have a web page on the most obscure topic in the world and get plenty of hits and get a whole community of people that follow it, we think the publishing world needs to adapt to that. The whole wonder is that you can produce small-volume things or moderate volume and that you can get the word out there. This isn't a world where everything has to be cookie cutter and sold in the mall bookstore, and yet I don't think the publishing world has fully taken advantage of that yet, which is why I had to form my own publishing company to do it. I wouldn't rule out publishing other people's books except for the fact that they too can have a light-weight model and publish things themselves. If I was publishing something that was only text, that didn't have lots of pictures and graphics and so forth, the ability to create and publish it online or publish it directly in electronic form is so simple that almost anyone can be their own publishing company. Movie studios today don't make movies. They finance movies that are made by directors and producers working effectively as independent companies. Of course, publishers don't write books with staff authors either. They finance them via these up-front payments. The interesting question, the bridge, is how can you get to a world where you have publishers that will finance projects which aren't necessarily the big commercial projects? In movies that has happened, and there are people like Harvey Weinstein and a whole variety of others, who have made very good money funding projects that aren't built to be giant blockbusters. Yet some of them do become that. Hollywood has gotten over the idea that quality sales are not commensurate or the idea that everything has to be a giant event picture. The book world needs to get over it.